The #8333 roller catch measures 1-1/4"W x 1-1/8"D x 1/2"H. The #800 magnetic catch is self adjusting. The #8329 measures 9/16"L x 29/64"dia. The #8332 measures 3/8"L x 21/64" dia. 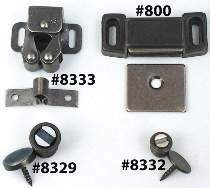 Mounting screws for #8333 and #800 are included.